We like being consistent, we humans, and we’re often embarrassed when someone points out that we’re contradicting ourselves. This would just be an endearing species quirk, except that the desire to appear consistent – to ourselves as well as those around us – can strongly influence our behaviour. Which makes it something that we world-changing types can use to sneakily achieve social good! Cue spooky laughter. There’s a lot of research out there showing how effective it is. 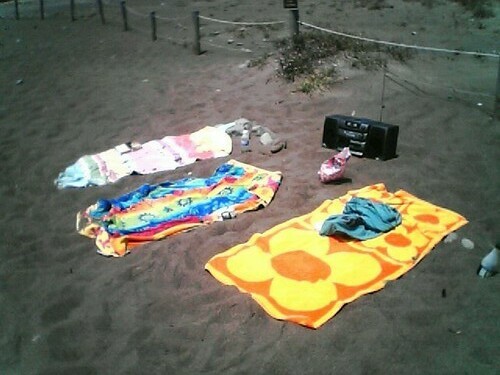 In 1972, Thomas Moriarty repeatedly staged a theft of a radio from a supposed “victim” who temporarily left it on a beach blanket. This theft was carried out 20 times in front of onlookers who had briefly spoken with the victim before he or she left the blanket, but only four of these onlookers did anything to interrupt the thief. However, when the victim had asked the onlooker to watch his or her things for a few minutes, 19 out of 20 onlookers intervened in the attempted theft, often physically stopping the thief and demanding an explanation. Moriarty attributed this response to a sense of commitment: the onlookers who had agreed to watch over someone else’s belongings had publicly committed themselves to intervene. Once they had done so, they felt they had to remain consistent with their stated intentions. Public commitments work too. Michael Pallak and William Cummings interviewed homeowners about ways they could lower their energy consumption and told them that the results of their efforts to reduce energy use would be published in the local newspaper. All the participants signed a form if they agreed to participate, but half of them were also told that their names would appear in the newspaper, while the other half were told they would be anonymous. A month later, the group who had agreed to their names appearing had used less energy than the other group. The potential uses of this principle are endless. If you want more people to show up for meetings, ask them individually in advance whether they’ll be coming. Ask potential volunteers whether they’re likely to volunteer sometime in the future. Before a blood drive, ask people why they think giving blood is a good idea. Ask your customers what they’re looking for, then provide it. 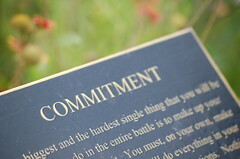 Making a public commitment helps us stick to personal goals, too, and I have to confess that some days I would never have gotten a post out there if I hadn’t committed to twice-weekly posting. Eighty posts so far without missing a day! I blame you. All of you. * Alert readers may have noticed that the commitment/consistency principle underlies certain other psychological tactics I’ve discussed, like the “foot-in-the-door technique” (covered here) and using people’s actions to change their self-perceptions (here). It really is a strong motivator. Subscribe to comments with RSS or TrackBack to 'I want to get you committed'. I love this blog! I have not done as well with my blog commitments, but my topic goals are not as clear. Now that I have a clearer sense of why I am blogging I will no doubt find this tool useful for myself. Now how can I get the readers to commit? Thank you! I have no doubt you’ll knock it out of the park once you get going. As for readers… I wish I knew! Spot on with this write-up, I honestly feel this amazing site needs much more attention. I’ll probably be back again to read through more, thanks for the advice!